There are certain books upon our shelves that get taken down time and time again to be read. There is no particular rhyme or reason to this post, other than to share the books that are my son's particular favorites. I know that they must be his favorites, because I get asked to read them alot for various reasons. Once a year or so our local library has a special program for young kids at which the kids get to select a paperback book of their choice. My son chose Baa-Choo! and it turns out it was a good pick! (I had somewhat dubious feelings towards it, but hey! It was his pick!) 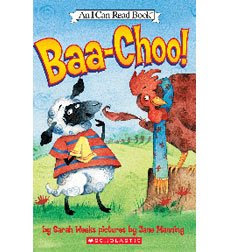 In this book Sam the Lamb has a sneeze that just will not come. He has the "ah" but not the "choo!" As my son will tell you, after he's done laughing (for the record, this is the first book I've read him that has made him laugh consistantly) that "the funny part is the 'no choo!'" And there you have it folks. It is really funny that friends Gwen the Hen, Sig the Pig and Franny Nannygoat cannot help him sneeze individually but collectively they get enough worked up within Sam to get that sneeze out! It's all about teamwork. Bookworm1 thinks its hilarious. Looking for a funny rhyming book about sneezing? Look no further. The Hair Book is funny because THERE IS A WHALE WITH NO HAIR in it. (Yes, yes, you read that right.) Hairless whales are funny things, dontcha know! This book is part of the Bright and Early Books for Beginning Readers which also includes another of our favorites, Hand, Hand, Fingers, Thumb . Actually, I think this is a pretty brilliant series in which you can learn about ears, eyes, noses and, well, hair! We own most of the series and enjoy reading through them with some amount of frequency. 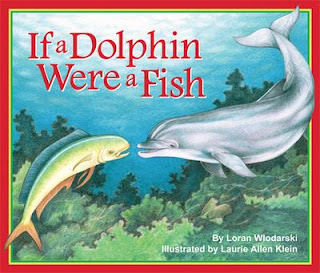 Another book we love to pull out is If a Dolphin Were a Fish which I have reviewed before. Bookworm1 references books that he enjoys a great deal, and this particular book is referenced a lot. "Oh! It's like Dolphina...!" "Oh! It's like a manatee....!" "Oh!" "Oh!" Bookworm1 is really good about making connections between the books we read and the things he sees. He internalizes stories and information and it pops out at random times, yes, and also at appropriate times when the information is spot on. It's pretty fun to watch him gather in information and let it out in a way that let's us know he's really thinking about the things we are doing, saying, and reading. I really enjoy reading with my son. I'm so thankful for the time and opportunity that I have to do so. It's fun for me to sit and share stories with him and I love every minute of it! I don't mind the re-reads at all. Rather, they delight me because I know he both cares about and enjoys the story. I wouldn't trade that for anything! What about you and your family? Do you have books that you like to enjoy together? I'd love to hear about them if you are willing to tell! Your review of the first one had me giggling big time! 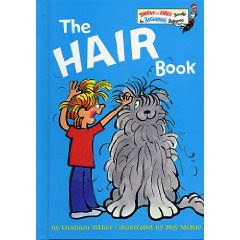 Never read The Hair Book... but we do have The Nose Book. Nothing like it for turning one's thoughts to the possible tragedy of having no nose! We're into sea books right now... Every time we go to the library the girls pick some out. Thanks for highlighting If a Dolphin Were a Fish -- going to put that one on the list! Oh, this post just has me smiling all over, Carrie. I LOVE random Read-Aloud posts! (You know, almost all of mine are random.) That sneezing book (can't remember the title right now) looks like one that might be a good pick for us that Lulu might be able to read on her own in a little while.